Another colourful plateful, inspired by my veggie guests Katie and Suzie. 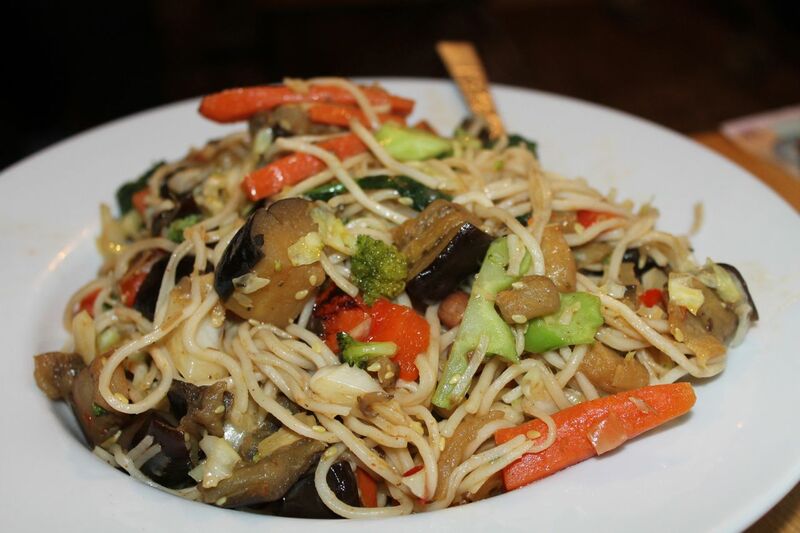 Tonight it was a spicy stir fry that was really flavoursome and satisfying, full of scrumptious spices and textures, crunchy greens and melting noodles, nuts and seeds for protein and plenty of fibre. Health in a plate, but more delicious than such a virtuous dish deserves to be. This recipe should serve six. Chop the aubergine and roast in oil for 30 mins on high heat. 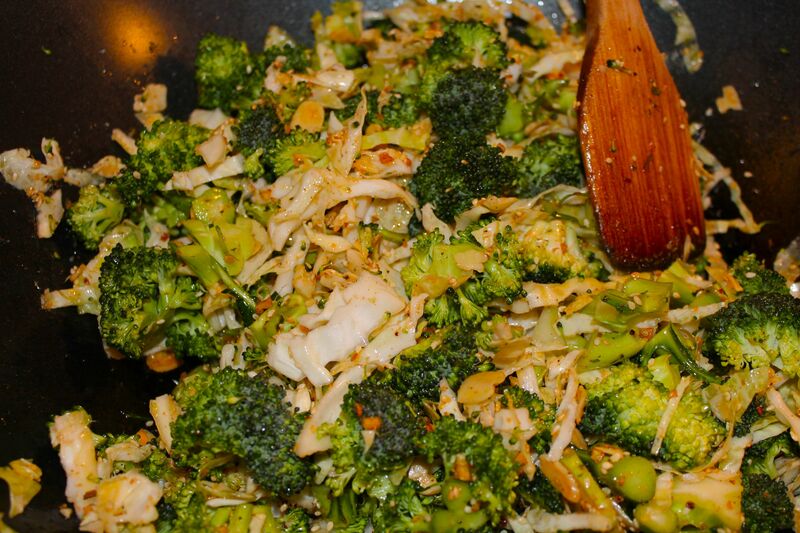 Chop all veg except the broccoli and cabbage, and sizzle in wok over low heat with spices, herbs and seasoning, and the nuts and seeds. When veg is soft, glossy and aromatic, turn the roasted aubergine into the wok and let it absorb the spices. Add the broccoli and cabbage and sizzle of high heat, adding the noodles (prepared as per packet instructions) for the last five minutes. Here’s a zingy vegan recipe that – if you’re dubious about brassicas – will transform your feelings about cabbage and broccoli. If you’re already a fan, this is another way with the greens. Lots of people hate the idea of broccoli and cabbage, probably because as children they were fed them cooked to the point of disintegration. Such a shame – not only are they incredibly good for you, full of nutrients and health-promoting goodies, but when properly cooked are delicious, fresh, crunchy, lively veg; and in this form, all the supper you can eat. Chuck everything except the green veg into a wok or a big saucepan, with a slug of oil (by preference, toasted sesame oil, but whatever you like to cook with). Stir it thoroughly and let it all sizzle gently until the sesame and almonds are starting to colour, and the spicy aroma is getting heady (about 10 mins). While that’s doing, chopped the broccoli into bite-sized bits, and the cabbage into fine slivers. Dump them into the wok and stir everything together for two minutes to coat the veg in spices, then turn up the heat and fry, turning and stirring continuously to avoid burning. It’ll take about 10 minutes to cook the veg till they’re bright green and al dente – still with a bit of crunch and character. Serve with rice or noodles and eat immediately, while good and hot. You can turn it into a meaty treat just by adding some chicken, pork or fine-cut beef, but I think it’s utterly scrummptious as it is.